At the time of writing this, the collection of my first four books is #1 in Canada and Australia (in several charts) and #3 in the UK. And I'm not talking about a niche, unknown category. I'm talking Crime Thrillers, Technothrillers etc. The real deal. It's this element that pleases me the most. I'm in the charts that have the toughest competition, and somehow, little old me has made it to the top of the pile, in two countries. How did I do this? How long did it take? This post is about celebration, about sharing my journey, not about boasting or showing off my achievements (heaven forbid). 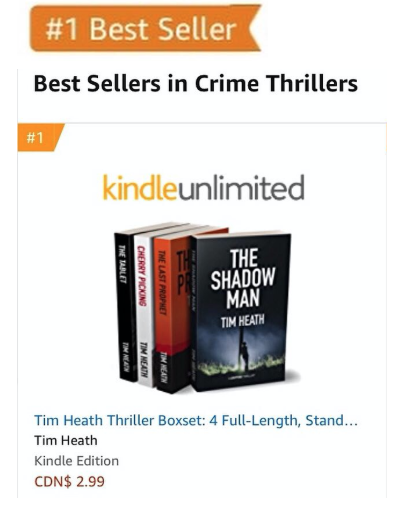 It is a huge milestone for any author to get that beautiful orange banner against your title stating it is a Best Seller, and to do that in more than one territory adds that International element. I published my first book nearly seven years ago. That book, Cherry Picking, is actually one of the four titles featured in the Boxset that got me this latest title. It's kind of fitting, really. In the years since that title first published, I've been hard at work. Very hard at times. I've learnt the craft of writing, developed that side of things so that now when I'm in full flow, I turn out the first draft in eight days and have a whole team of eyes looking at it, but still manage to get it to market within months. That side feels very polished. I completed my fifteenth novel the other month. That one will come out in June. But I wasn't selling much. I'd dipped into stuff, had all the courses that tell me how, but was scared. And nervous. Advertising costs money. And I knew I wasn't a marketer. However, despite those fears, I made the decision to switch hats a few weeks ago. I told myself I could not write again until I'd sold a specific number of books. The target I set wasn't huge by any moderately selling author's standards but did represent a higher total than my entire 2018 sales amount. So it was big for me. The start wasn't promising. I remember calculating, based on the sales in that first week, that it would be over thirty-nine years at that rate before I would be writing again. But, I did manage to get a BookBub feature deal agreed and scheduled for Saturday 16th March. Yesterday. That gave this novice marketer in me something to build towards. Last Saturday, 9th March, while my daughter had a swimming lesson, I sat with my iPad designing a few images to use with adverts. I had a book coming out on Monday, so knew I wouldn't focus on the promotion until Tuesday onwards. The idea was to get the book in a good enough position that the BookBub email would be enough to push it over the line. (For those who don't know what BookBub is, it's a reader's daily email service that profiles a small handful of books each day that are on offer. Their thriller list, for which my books are in, has 690,000 people who get the daily email. It's a big deal, is very hard to get, but costs a lot). The last and only time I had a feature deal, it put The Tablet #1 in Australia. Incidentally, that title is also included in today's collection. You can view (and follow) my profile here on BookBub (and they let you know when I have a new book out, as well as any future deals). For the collection I had on offer, I created and uploaded by first adverts on Tuesday 11th March. I didn't really know what to expect. I should say, by this point, I had already lowered the price of the Boxset. I had also reached out to a few author friends, as well as arranged a promotion with Book Cave, some of which were going out on that Tuesday already. What makes this service special is books are carefully indexed so readers can be specific with levels of bad language etc. Plus their featured deals are much cheaper than BookBub (admittedly, with far less reach). Before the ads started, I recorded the highest chart rank for the title in each country, mostly so that I could see if the ads were having an impact. These were the starting positions (rank in the brackets): USA (1420), UK (477), Australia (852), and Canada (570). In other words, no visibility at all! Day One was a slow but steady start. I made a positive ROI (return on investment) and saw the UK (175) rise, but the other three fell. Day Two saw Canada continue to fall (619) but there were rises in the other three, UK (42) and Australia (35) giving me huge hope that something was working. Day Three was my first rise in all four territories. Ad spending was increasing, but the rankings were improving, and these ranks were recorded first thing in the morning, I should add. They now read USA (111), UK (13), Australia (11), and Canada (29). The close top ten rankings in two countries fuelled me on. I increased the spend, trying to understand what a successful advert looked like, and adjusting where needed. Day Four didn't see much movement. Only the USA (87) rose, joining the other three in the top 100. Remember, only the top 100 books are actually displayed in the chart on the Amazon website, the first 50 on page one, the second 50 on the second and final page. So now they were visible. It is hard to tell how many, if any, books sell because someone sees it in the chart and buys it. I wish I knew! Day Five saw, for the second time, a rise across the board. USA (64) and then the other three breaking into the top ten, UK (8), Australia (6), and Canada (7). I was running about six different adverts, one being split tested with four designs. Day Six. BookBub day. Was I close enough? There wasn't a lot to go on in the morning, with USA (79) and Canada (13) falling down the charts from the highs of the morning before, Australia (6) holding firm and the UK (5) getting to the highest point all week. The email went out early afternoon. I was constantly watching the numbers (sales were double from the day before, but not astronomical). However, having watched a film and started my evening, I checked back at nearly 10 pm and spotted that glowing, orange banner in Canada. I'd reached #1. Having once before had that in Australia, I was banking on either the UK or Canada to make me an official International Best Seller. They didn't disappoint. Day Seven saw the third day of complete rises across the board. I woke up to not only be #1 in Canada but in Australia too. The UK (3) was the highest it had been all week. I doubled down on the ads for the few hours there were left, but by midday, it had not risen. It's still number three at the moment. The USA (74) wasn't included in the BookBub coverage, so their rank has only been increased by adverts. I expect the rankings to drop from now on (all the ads are off, and the book is back to its pre-promotion price). I hope there are those who, seeing the charts for the first time, observe my book at the top, and this causes them to buy it. I can only dream. So it has taken seven years––years of crafting, honing, improving. I've created a product that, when the marketing works, when readers find me, they are getting books that are error-free, flowing, enjoyable and tested. I know people will love them. And there are now many more books for them to go on and read. But it also took just six days. Frantic advertising, a BookBub feature, some help from friends, and nerves of steel to spend when the adverts are working. March will undoubtedly be my best month as an author. It should be, with the spend I've put in. But my goal has always been to find readers willing to pay for my books. And if they've paid, they'll most likely read them, too. Right now, hundreds of new readers who this time last week didn't know me now have four of my novels on their device. If these people turn into fans, reading my other books and future ones yet to be released, this whole week would have been a huge success. It already is, of course. Being a Best-Seller isn't easy, especially in the Crime Thriller chart. And whatever happens, nobody can take that away from me now!